Irish Rail Four-Wheel Cement—May 2005. Yesterday, 30 November 2018, I located a collection of my Irish Rail slides from 2005. 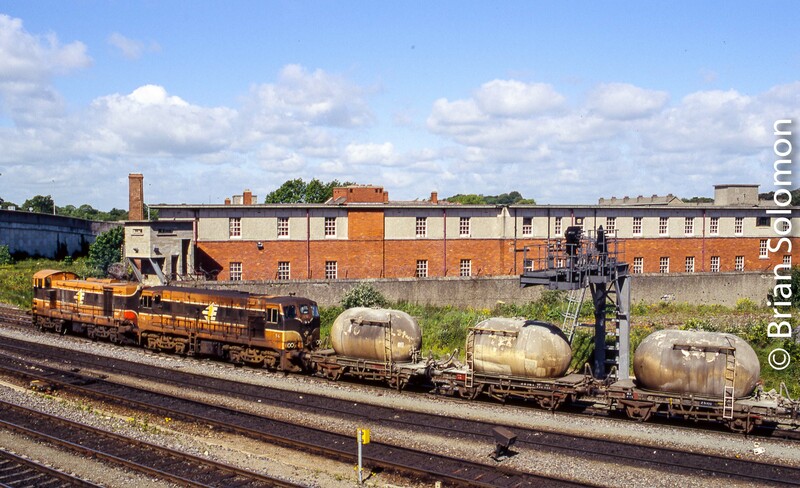 Among them were these views of ‘bubble cement’ trains (consisting of pressurized four-wheel powdered cement wagons) passing Islandbridge in Dublin on 26thof May that year. These were exposed on Fujichrome Sensia II (100 ISO) and processed at Photocare on Abbey Street in Dublin. I scanned these using an Epson V750Pro flatbed scanner making large TIF files, then made colour and contrast adjustments using Lightroom to improve presentation. In addition, I also implemented some digital sharpening to make the photos prior to outputting as scaled JPGs (for Internet presentation) to make these appear closer to modern digital images. 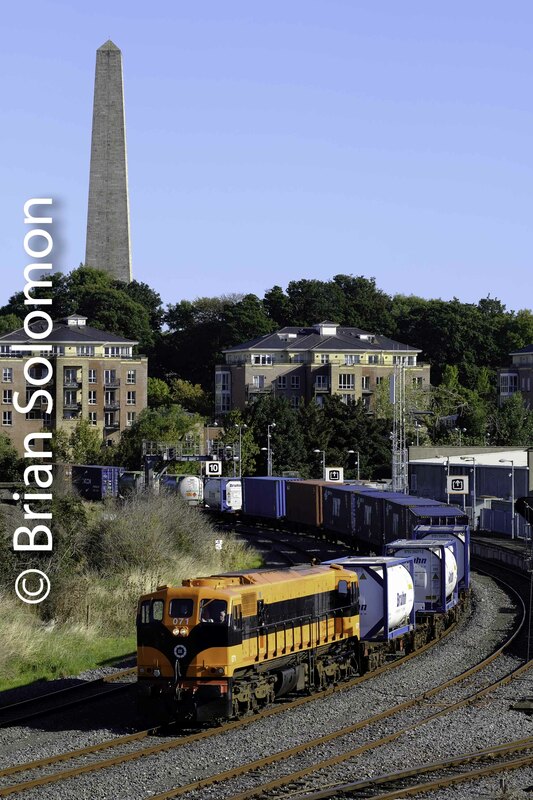 Irish Rail 134 and 156 lead a Platin to Cork cement train at Islandbridge Junction on 26 May 2005. Exposed using a Contax G2 rangefinder with 45mm Zeiss lens. Empty cement led by Irish Rail 077 approaches the Phoenix Park Tunnel in Dublin on 26 May 2005. Exposed with a Nikon F3T. Irish Rail stopped operating cement through Dublin about a decade ago, and so these views are now historic. Today, 12 September 2018, Irish Rail 071 worked the down IWT Liner. Monday on Tracking the Light, I posted my foiled attempts at picturing Irish Rail’s heritage painted 071 on Belmond’s Grand Hibernian. Persistence pays off. Well, that coupled with a bit of luck. 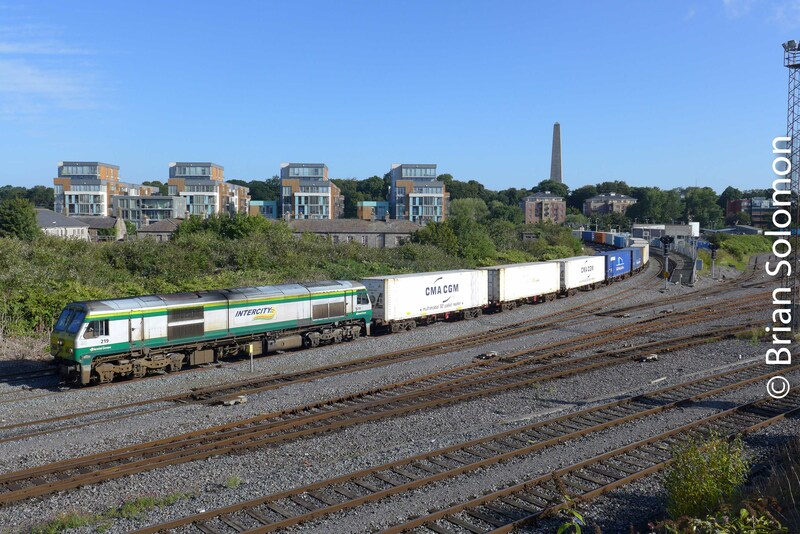 A few minutes ago (12 September 2018), I returned on spec to my oft-photographed location at Islandbridge Junction for the down International Warehousing & Transport container train (Irish Rail’s IWT Liner that runs Dublin to Ballina, Co. Mayo). I expected locomotive 234, which has been working this run for a while. Instead, I was rewarded with 071 in glossy orange paint. The clear sunny morning was an added bonus. Here are two versions. One is the in-camera JPG using the FujiFilm ‘Velvia’ colour profile. The other is an adjusted file from the camera RAW, where I’ve lightened shadows and adjusted saturation and contrast. You can like one or both. Irish Rail 071 at Islandbridge Junction in Dublin with Wellington Testimonial. Camera JPG featuring Fuji Velvia colour profile. Scaled for internet. If these don’t work for you, I also made a Fujichrome Provia 35mm colour slide using at 40mm lens that takes in the whole scene. Variations on a Theme: Irish Rail 219 at the same place, again. However, everyday is different; locomotives and locations are only two elements that make a a successful railway action photograph. Weather, lighting, angle to the tracks and the focal length of your lens all play important roles in the end result. Also consider the cleanliness of the locomotive and the variations in consist. 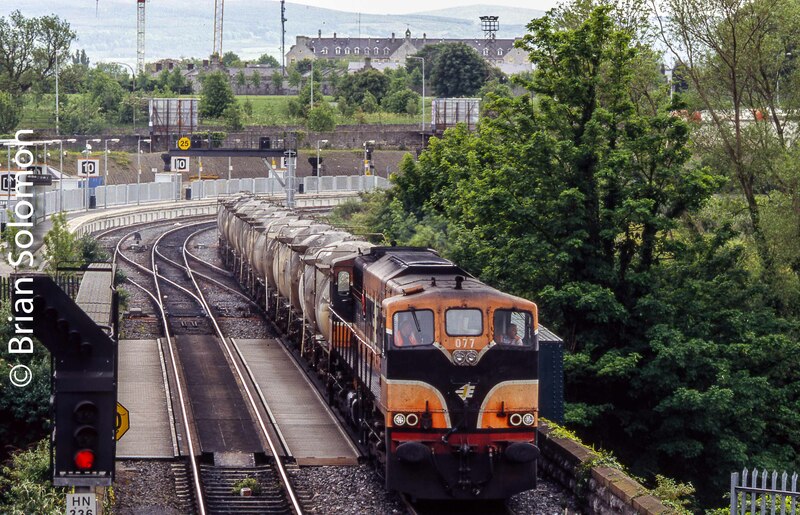 There was a period where Irish Rail 219 regularly worked the Dublin-Ballina IWT liner freights. When I’m in Dublin it is relatively easy for me to reach my standard location and catch the IWT on its down-road journey. In fact I often do this on my morning walk, or on the way to the supermarket. 5 March 2014; exposed using my now defunct Lumix LX3. It was a few months later, in August of 2014, that I made this sunny day view using my new Lumix LX7. It helps to have a clear bright day and a clean locomotive. I’ve moved a little bit west of my usual spot and working with my FujiFilm XT1 fitted with 18-135mm zoom with an external grad filter that I was using to improve the sky detail. I’m positioned a little higher here too. Unfortunately, this angle brings in more urban clutter. 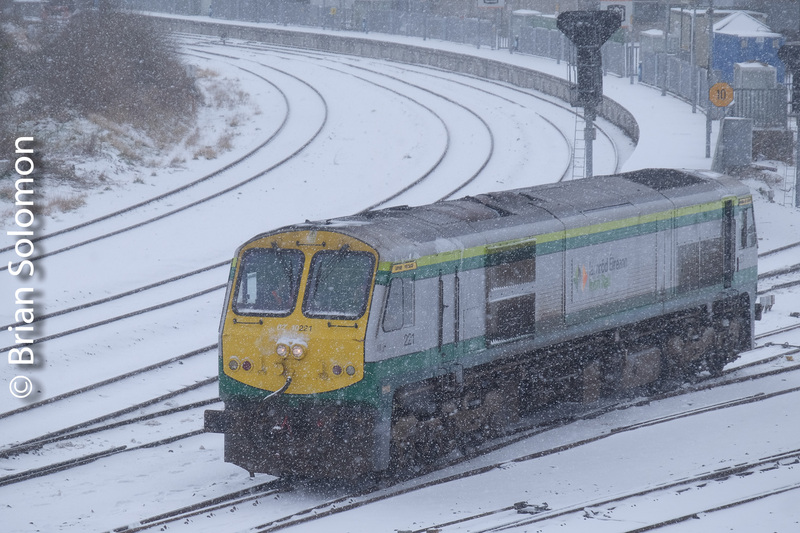 Irish Rail in the Snow in Dublin—Today, 28 February 2018. Snow is a real rarity in Dublin. After a little more than an inch, a ‘red warning’ was issued. 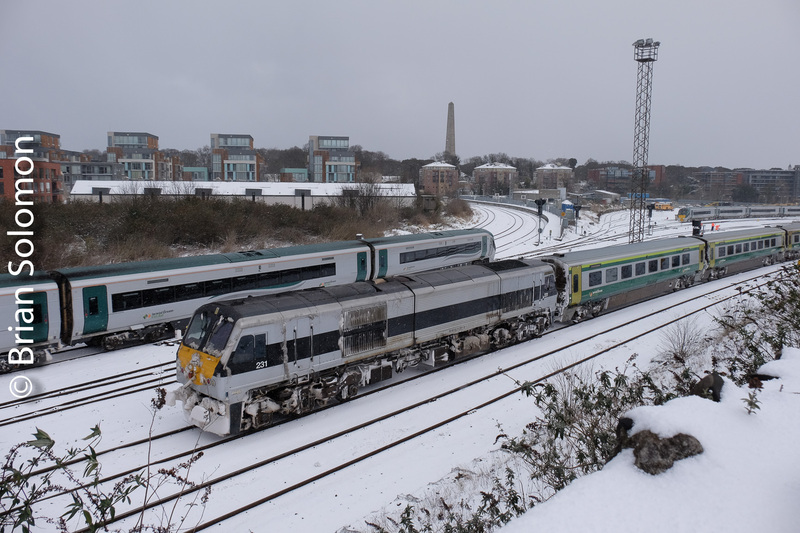 Irish Rail kept its passenger trains on the move, although some were running a little behind schedule. I braved the arctic conditions and hoofed it up to my usual spot. If all goes well, I may head out again later on. Photos exposed this morning using my FujiFilm XT1. A Grand Canal Docks ICR features one of the recently introduced yellow coupler covers designed to keep snow off the coupler. ICR’s pass at Islandbridge Junction. 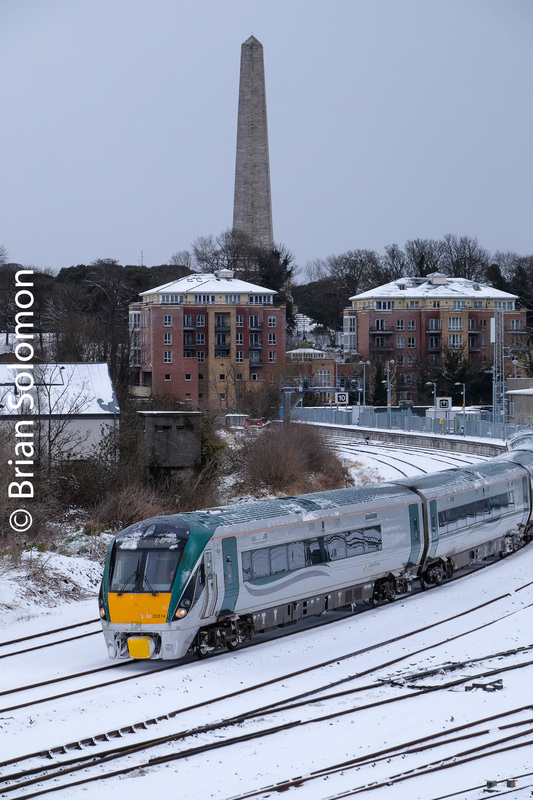 Irish Rail 231 in the ‘raccoon’ livery works the up-cork on its final leg to Dublin Heuston Station. 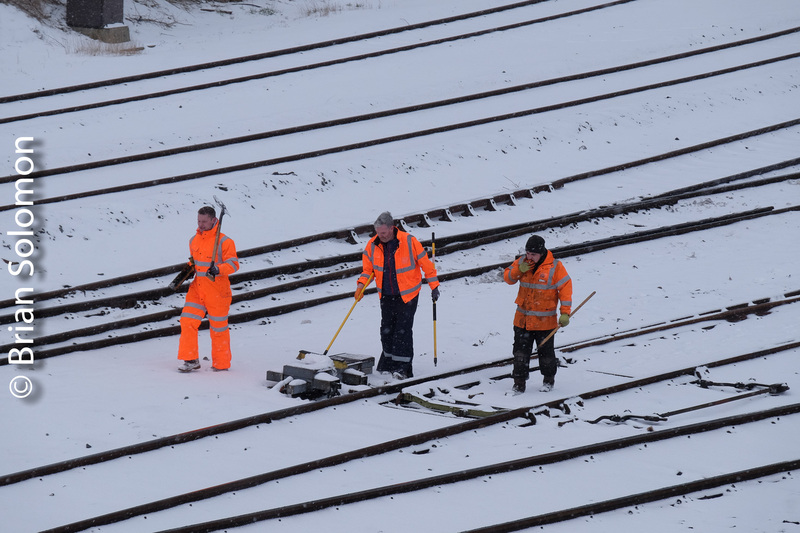 Irish Rail snow removal team. 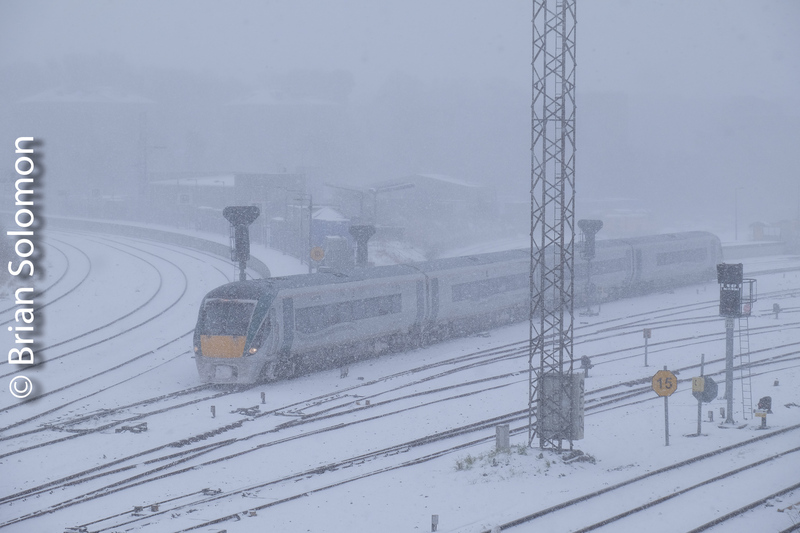 Snow falling at Islandbridge Junction. Irish Rail 221 light engine. Tracking the Light Extra Post: Irish Rail 071 leads Saturday’s IWT Liner at Islandbridge Junction. Locomotive 071 is the class leader; one of Irish Rail’s 18 General Motors-built model JT22CW dual-cab six-motor diesel-electrics. To make the most of slight diffused afternoon light, I opted to use the camera’s ‘Velvia’ colour profile, which emulates the characteristics of Fuji’s slide film of the same name. The 18-135mm zoom lens on the Fuji X-T1 allows to rapidly change the its focal length. 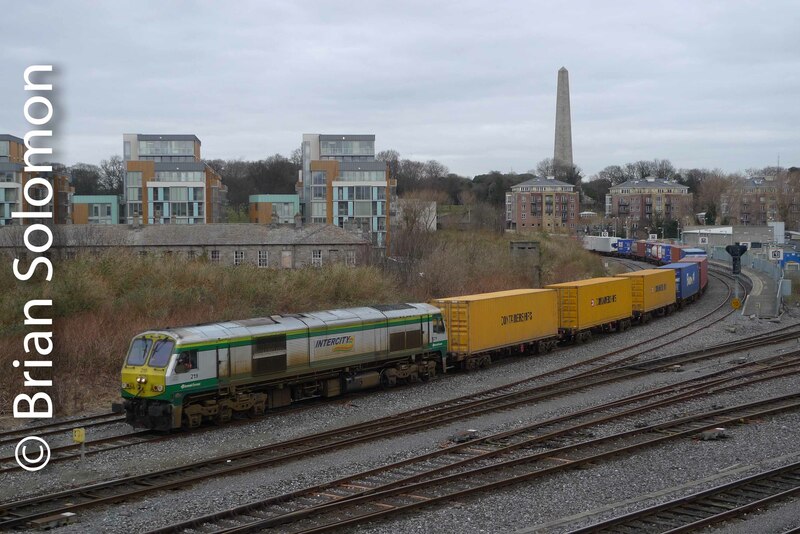 Here’s last week’s Saturday down IWT Liner (International Warehousing and Transport container train from Dublin’s North Wall to Ballina, County Mayo). 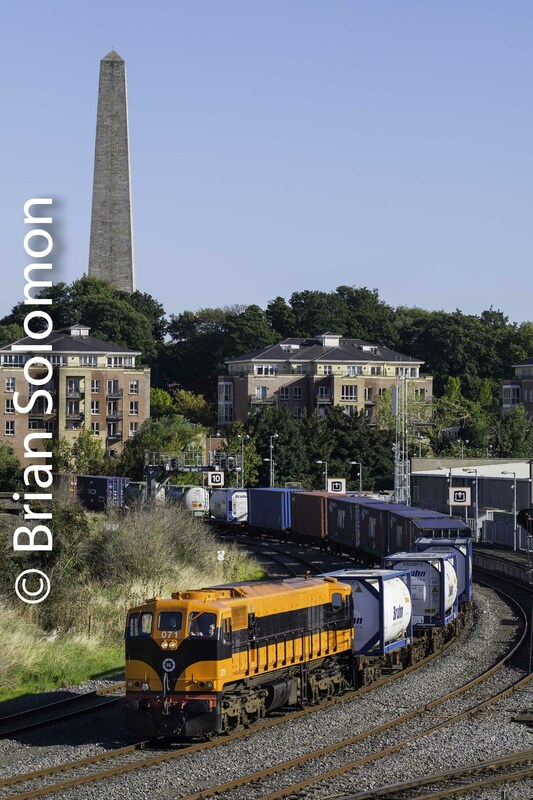 RPSI 461 at Islandbridge Junction, Dublin, Ireland at 11:53 am on September 4, 2014. Canon EOS 7D with 200mm lens. Just a few minutes ago, Railway Preservation Society Ireland’s 1923-built 2-6-0 461 passed Islandbridge Junction near Dublin’s Heuston Station. The locomotive is on its way to Limerick. Nice to see steam on the move in bright daylight! RPSI 461 at Islandbridge Junction, Dublin, Ireland at 11:53 am on September 4, 2014. Lumix LX7 photo. Just a minute later, uniquely painted class 201 diesel 8208 rolled the other way. but Tracking the Light posts new material every morning. The Marble City Tour at Islandbridge. Score One for the Sun! Railway Preservation Society Ireland’s July 27, 2014 ‘The Marble City’ tour was scheduled to depart Connolly Station in Dublin at 0935. It was essentially at sunny morning, but when I arrived at my spot in Islandbridge, a location known colloquially among local photographers as ‘the Box’, a band of light cloud was muting the sun. I waited patiently, Canons at the ready, for the sounds of locomotive 461 exiting the Phoenix Park Tunnel. Finally: a shrill whistle, a puff of steam and the clatter of carriages over the Liffey—and then! Yes, at the last possible moment the sun emerged. I exposed a few slides and these digital photos. The Marble City tour passes Islandbridge Junction near Heuston Station in Dublin on the morning of July 27, 2014. Exposed with a Canon EOS 7D and 40mm pancake lens; ISO 200 f8 1/500 sec. Locomotive 461 at Islandbridge Junction. I can almost see my apartment from here. As quickly as it had come, the train was gone. Yet, for several minutes, I could hear the engine working up the ‘gullet’ toward Inchicore. Little did I know, but nearly 12 hours later, I’d photograph the late running return trip! Stay tuned! Tracking the Light Special Post: TRAINS NEWS WIRE REVIEWS THE TWILIGHT of STEAM. Extra! Extra! Irish Rail 077 in the new Livery makes one its first daylight runs. Irish Rail locomotive number 0117077 leads a wagon transfer over the River Liffey at Islandbridge at 4:25pm on April 10, 2013. Canon EOS 7D with 28-135mm lens. 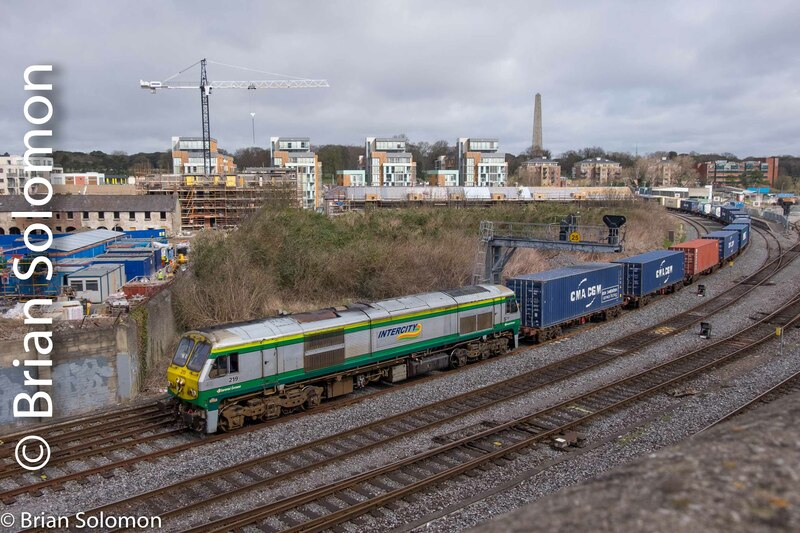 A few minutes ago, at 4:25 pm, April 10, 2013, I caught Irish Rail’s 071 class locomotive 0117077 working a wagon transfer from Inchicore to Dublin’s Northwall . While the locomotive has worn this new paint for about a month, today it finally left its sequester at Inchicore works. It was understood to have worked a trial to Sallins (on the Cork road) earlier in the day. The locomotive’s expanded number is intended to comply with European numbering conventions. Irish Rail 0117077 leads a wagon transfer over the River Liffey at Islandbridge at 4:25pm on April 10, 2013. Canon EOS 7D with 28-135mm lens. 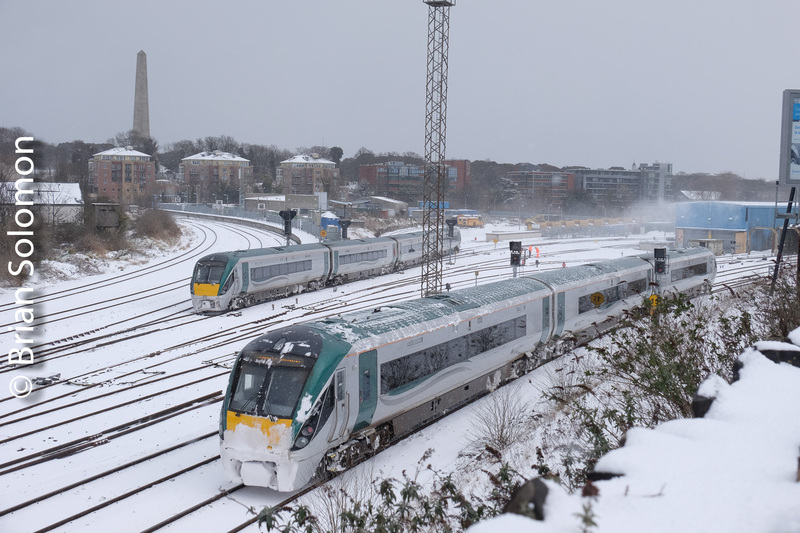 Irish Rail‘s Day in the Sun—April 2, 2013. It was a rare day in Dublin. After what has been reported as the coldest March on record (and, undoubtedly one of the grayest), waking up to a clear blue dome was a joy. 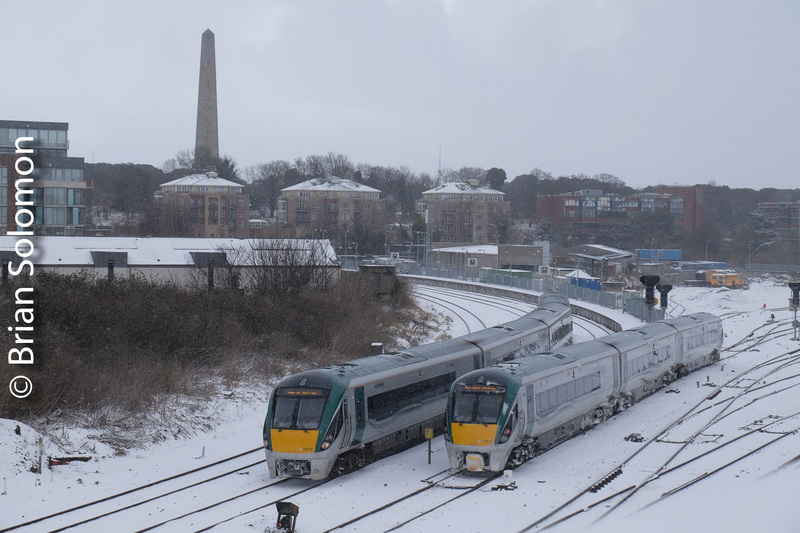 As a weekday, Irish Rail had fair bit on the move, above its normal schedule of passenger trains. Irish Rail Class 201 number 224 rolls through Islandbridge Junction with the Dublin-Ballina IWT-Liner on April 2, 2013. My first move was to catch the ‘down IWT Liner’ (Dublin to Ballina International Warehousing and Transport container train) from my usual spot. This place is easy, too easy, so has often become my default location. Not to linger, I hopped on the LUAS (Dublin’s tram system) to meet my friend Colm O’Callaghan down (at) the North Wall (near Dublin port). We proceeded to a favored overhead bridge at Claude Road on Dublin’s North Side to catch Irish Rail’s last orange 071 (number 084) working a long welded rail train up from the permanent way depot (track maintenance yard). This was delayed coming across from Islandbridge by the passage of scheduled trains on the Sligo Line. A Sligo to Dublin Connolly passenger train passes Claude Road, Dublin. The long welded rail train approaches Claude Road in Dublin on April 2, 2013. Once standard, orange trains have all but vanished from Irish Rail in recent years. General Motors-built class 071 number 084 is the last locomotive in traffic to wear orange paint. A new livery is being applied to the 071 class presently. After catching this unusual train, we moved down to the Cork Line at Lucan South to wait for the ‘Up IWT Liner’ from Ballina led by another of the 071 Class General Motors diesels. All of these images were exposed with my Canon EOS 7D. Had I anticipated such a productive venture, I would have brought along a film camera. Perhaps next time! The Ballina to Dublin IWT liner works ‘up road’ on the slow line near Lucan South in west suburban Dublin. Not far behind is a Cork to Dublin-Heuston Mark4 on the fast line. This will overtake the freight in a few minutes. I’ll be presenting my illustrated talk “Ireland through American Eyes 1998-2008 My first Decade in Ireland” to the London area Irish Railway Record Society on April 18, 2013. The 1020am Cork to Dublin-Heuston passenger train screams along on the fast line near Lucan South.